As a fan of the Nickelodeon series Avatar: The Last Airbender I am perplexed why the network is ignoring the best marketing opportunities for it. The show is an American anime that takes many of the familiar themes of the genre — magical children, the struggle against an evil empire, etc. — and used them to tell a story that is emotionally satisfying, intelligent and fun. It doesn’t hurt that it happily borrows ideas from some of the all-time great anime. 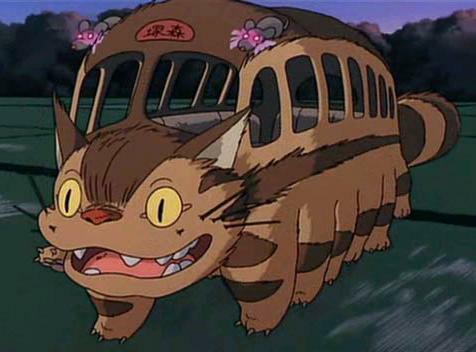 For example, there is the air bison Appa (left) a homage to the cat bus (below right) in Miyazake’s My Neighbor Totoro. It is a show that Collateral Damage Jr. and I watch together happily. From what I’ve seen Nick has marketed this in the exact same manner it has marketed other successful animated shows like Bob L’ePonge and The Fairly Oddparents. They have done licensing to major toy makers and the fast fooders. There are also the t-shirts, hats, backpacks and other standard items. Given this and the fact that the show is about to enter its fourth season, some may wonder why I am saying Nick is missing it with the show’s marketing. I just returned from my annual sojourn at Anime Boston — a three-day long fest of anime, manga, and anything vaguely related to that. The last semi-official attendance figure I heard was 14,000, so it’s no small thing. There were Avatar fans in abundance, as there have been at every anime convention I’ve been to since the show debuted in 2004. It is easy to tell who the fans are. They’re the people dressed as the series’ characters (even Appa) in costumes they made themselves. They are also the artists selling their own drawings of of the various characters (if Nick interferes with that then they are truly idiots). Each one of these people is an asset being ignored by Nick. The age range for these conferences is generally high school to early 30s (I am an outlier, to put it mildly) — well past the 6-11 slot that Nick mostly aims at. The con features an enormous dealer’s section where people come to find tchotchkes of all sizes emblazoned with their favorite characters on them. Indeed, the dealers’ room is always a huge draw at these things. I spent a lot of time in it — as usual — I can report that all those dealers didn’t have so much as a single Avatar item for sale. In fact I have never seen an Avatar item for sale at any of these cons. A glance at the Nick online store makes it clear why. Other than the Avatar t-shirts and plushies, there is nothing that any fan in this age group would buy. These are people who want to wear their brand identification — which rules out action figures and Lego sets. My entirely anecdotal research suggests that Nick isn’t having much luck with selling these items to the 6-11ers. I always see a LOT of Avatar merchandise in the discount aisles at Toy R Us and other big boxers. It seems to me that this is an example of Nick ignoring The Long Tail — selling less to more people — and blowing the opportunity to turn Avatar from a niche hit into a genuine phenomenon. As a result of its inability to market patches, stickers, keychains, clothing and accessories that might appeal to anyone over the age of 11, Nick is leaving a lot of money current and future money on the table. Anime fans are trendspotters and trendsetters for the youth market. These are the folks who knew about Yu-Gi-Oh, Pokemon, Hello Kitty, Emily The Strange, and a host of other brands long before they became mainstream sales phenomenons. While some of them (including CD Jr.,) are in the 6-11 age range, most are not. But they are enormous influencers on this market. That’s because they are the big brothers/sisters who define cool for the under 12-set. Another thing Nick needs to know is that the anime community is very design conscious — so it’s not enough to simply slap the characters on to product. Find some good graphic artists — I’m sure the folks behind Avatar could point you in the right direction — and apply the same creativity that marks Avatar the show to its marketing. Some outreach/listening to the fans the show already has could make Avatar into a SpongeBob Squarepants type of earner for Nick. Failure to do this will make it nothing more that a slightly more successful Code Lyoko — the French anime franchise that Cartoon Network killed with its one-size-fits-all approach to marketing cartoons. This entry was posted in Anime, Marketing, Marketing to kids, Miyazake, Nickelodeon, Nickelodoeon, SpongeBob, SpongeBob Squarepants, Totoro and tagged Airbender, Anime, Avatar, Code Lyoko, Hello Kitty, Manga, Marketing, Nickelodeon, Pokemon, SpongeBob Squarepants, Yu Gi Oh. Bookmark the permalink. OK, so it should show a picture of Spongebob brand Edadame. Better than twinkies. why are you a fan of this? Also, I’m a sucker for a giant flying bison. And I, too, miss Code Lyoko. In other news, due to the upcoming movie, maybe we’ll see some good merchandise. I could care less whether or not Nick is making money! I want resin collectibles! I agree. If there was Avatar stuff tht wasn’t too babyish for even my little sister, I’d toatly buy it. You are totally right. All what nick tries to do, especially lately, is to swim in their merchandise money- and they’re not even good in sell audience! They totally, as Bato of the water tribe said, “Lose in a leafhead”. I think what Nick fails to realize is that shows of this proportion, with such an advanced story line, appeal to older viewers as well. Their lack of merchandising shows this ignorance. I think everyone is missing out in this case–Nick, the show’s fans, and the show itself. It’s pretty dumb that they’re not selling to the older age groups. I mean, we’ve gotta make up the majority of the people watching it, since an 8-year-old would probably be more interested in farce comedy than an actual plotline. Not that I don’t know any younger kids that watch Avatar, because I do, but they need more for US. Yeah, I don’t understand it, either. I mean, what other Nick shows have people cosplaying their characters at almost every con in the US or panels that fill up so fast, some people have to stand outside the room to listen in? It’s ridiculous the way Nick is treating one of its most popular shows, especially with the release of episodes on DVD before they even air. Thank you for such a well written nod to this amazing show. I agree with you, and find it disappointing that it’s harder to market a thoughtful and intelligent series like Avatar, than to market most of the other material supported by Nickelodeon. To me, it’s already a phenomenal hit. I would like to see it reach it’s full potential though. Perhaps the live action movies directed by Director Shyamalan will introduce the story to a broader audience, allowing it’s true brilliance to be appreciated. Until then, the fans will keep enthusiastically supporting the show. It’s hard not to love it! I couldn’t agree with you more. My local con is rather small, only about 3000, so not only is there nothing in the Dealer’s Room, but it’s usually a challenge to find things in the Artist’s Alley as well. If they had more official stuff, I’d buy it, but they don’t, so I don’t. Lost money on their part. Weirdly there is a ton of toys and other Avatar things in The Netherlands. I know cuz i got a talking Aang doll (lol `Ik ben de Avatar`) AND a water bottle! Seems the advertising won’t stop here. Yeah, I always figured they were giving the good stuff to the europeans. Okay, I love Avatar. In my opinion it is the best thing ever to air on Nick. It’s a wonderful show, with great humor, sarcasm, characters and every episode has a purpose. However, my friends and I have often wondered how much better it could’ve been if it was aimed at an older audience… But I wonder also, how far would it have made it if it was aimed for older kids, lets say 13-16 or so. Anyways, I’ve often wondered why there are never any Avatar items at conventions, they could make a killing if they did! My daughter is twenty and draws art and anime for a hobby while attending Pre-Med in college. She and I (age 50+) both love watching Avatar. Anyone who ever read comics, played D&D, played RPG’s of any kind, videogames and a lot more all have a heart that should, can and will enjoy anime and the Avatar. More bite sized the the tomes of Harry Pothead and better than Robot Chicken or South (They killed Kenny!) Puke of Lack of Comedy Chunnel. I just need to say…the series finale of Avatar was sooooooooooooooo cooooooooooooooool!!!!!! I really have to wonder though, how Shyamalan could make a bald monk with arrows all over his body riding on a 6-foot flying bison look serious enough for a mainstream film. And I agree, the show could use a bit more marketing and exposure. I saw the series finale and was both thrilled and disappointed. Just watching the credits and seeing that the storyboard for the entire last 4 episodes were revised, you can tell that the animation team was rushed without option for a season 4. I was at least glad to see the series ended and did not hang indefinately like so many other syndicated animated shows that networks fail to value. I’ve always felt that the station responsible did not see the full potential of this show and how serious the fanbase has become. In our late twenties, my friends and thier friends have all found this show very gripping and entertaining. I followed the Avatar from day 1. and i saw that it was the best anime series i have ever seen. there was so many parts of the show that could really touch you if you paid atention. like Love aang and Katara you could see that they loved each other from the first time there eyes met. and through out the year traveling the world there love grew stronger and stronger. Most shows do not have this in them or at least how the writers of Avatar Put it in. and also Friendship, one of the most important thing in ones life. you notice how the team is always together and always fighting for one another to save each others life its a very powerful aspect of this show. I saw the finale and was happy to see that Aang could kill the fire lord with out killing him. this shows that even the greatest of disputes can be solved without violence and mass killings. Aang never killed any one in the show. he only imbolized them for a brief period of time. I think The Avatar reflected on the world today. how we solve all are problems by fighting and killing. how we ignore the earths crys for us to save the imbalance we have caused, I think the Fire lord symbolizes all of the human race, and all we have done to destroy our home, wars, pollution, and poaching. We have created and imbalance in the earth with Global warming. this show has really touched me, and i am sad its over so soon. i think they should make another series, maybe one that follows another avatar an older one. or one that shows how each element started… something along those lines. Avatar is by far the best anime since Pokemon, because the characters have unique personalities [unlike most kids shows] and the plot line is really quite engaging. Nick needs to market more shows towards older people, in their teens and above. If nick slightly altered their marketing for older kids, shows like Avatar would have a much stronger pull and attract much more people. 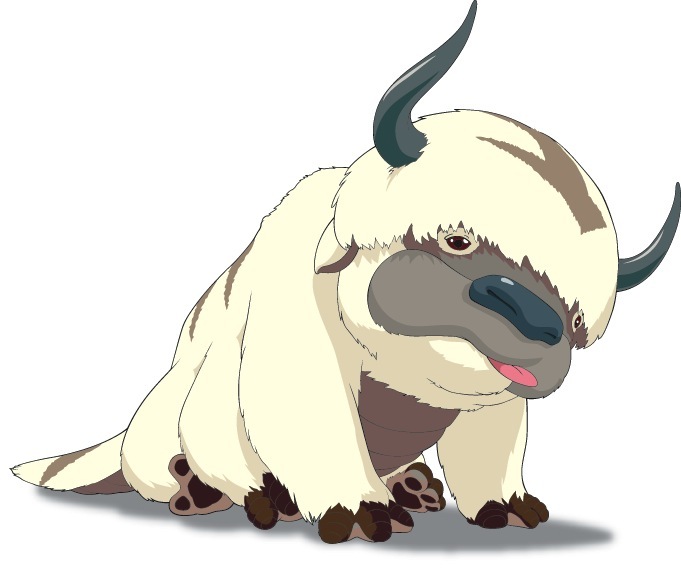 They also need more Appa and Uncle T Shirts!! Great article, I totally agree on just about every point you make. Thanks for publishing your worthy opinion!